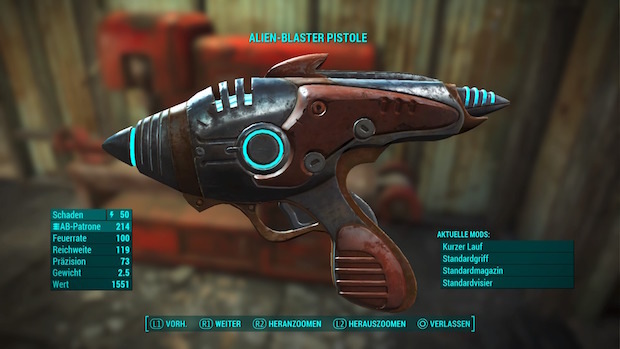 Possibly the most well-known weapon from gaming, this old friend of ours can do anything. Whether it be exploding barrels, breaking down mysterious wooden crates with health pick-ups in them or killing waves of enemies, if there’s one weapon I want if the Combine ever invades, it’d be this. The weapon that has so many times caused someone to be called an “Awper noob” or some insult to that effect in decades of online gaming. Is there another weapon in gaming that has caused so much happiness yet so much anger? This behemoth of a weapon stands for @Big F***ing Gun, and it’s easy to see why. Destroy everything in your path with the push of a button. Waves of enemies are gunned down effortlessly. Just be careful not to charge it for too long, because it’ll explode. And kill you. And everything around you. This weapon can do a lot of things. Whether you’re tossing explosives at monsters or just playing fetch with a dog, the gravity gun will assist you in many different ways. Its distinctive shape and orange glow make it an easily recognizable and legendary weapon (or dog toy). There’s no better weapon for saving the people of a dictatorship! Free them from the oppression of the government by tethering civilians to cars or attaching soldiers to cans of fuel to create an impromptu fireworks display. Or bring down a helicopter or surf a car. It’s up to you really. Perhaps the only weapon to have caused more rage and controller throws than the AWP, this homing weapon can be used to get an advantage in a race, and stop anyone in their tracks. Just make sure not to go over any banana skins on your way to the finish line as that could be a REAL danger. It’s overpowered. It’s highly accurate. It has a huge amount of ammo. It’s the RC-P90. A game of Goldeneye could be turned in your direction if you brought this baby out. This is all you need for a session of exploring a hostile nuclear wasteland. Become a one-man superpower with a weapon that fires miniature nuclear weapon. Try to avoid the blast and radiation and you’ll be okay! Well, probably.